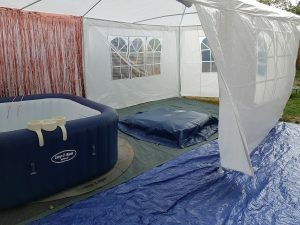 One lucky 11 year old girl is having a cracking hot tub birthday party. We set up in this huge marquee / gazebo, which had been decorated with tinsel, and they were just adding a massive line of LED lights in a heart shape. Set in a lovely garden in Kings Langley, it looked like they were expecting a fantastic day under the protection of the marquee, whether too sunny or if there’s an outbreak of rain. I hope they have a fab time at the weekend!